Cyber theft is the fastest growing crime in the US. Crime damages will cost the world $6 trillion annually by 2021. Cybersecurity spending is expected to exceed $1 trillion by 2021. As the world goes digital, humans have moved ahead of machines as the top target for cyber criminals. Today’s hackers smell blood, not silicon. Top targeted industries include healthcare, IT, energy, communications, critical manufacturing and more recently, family offices. Across the board, breaches that took months or longer to detect largely fall into categories like cyber espionage, point-of-sale-intrusions and privilege misuse. Packet Continuum software and deployable cybersecurity platforms have disrupted the market with open data access, smooth scale, and long timelines at a very low cost. 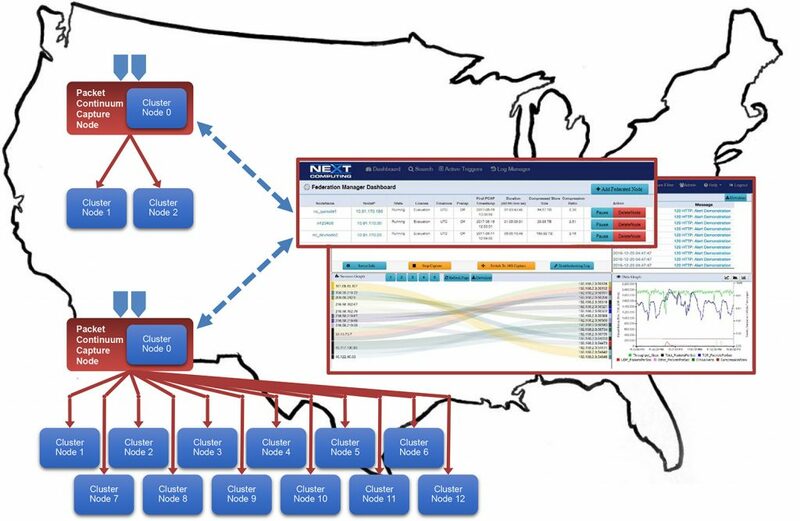 Real time visibility and forensic insight into your critical network data resources is realized for small to large scale configurations. NextComputing proudly announces a set of NEW features that further enable uncovering the immutable ground truth of any critical event, not merely an interpretation. Packet Continuum is compatible with third party commercial and open source tools providing you with a complete Cybersecurity protocol. The IDS Alert configurator and DPI Analyzer enable multi-level signature and behavior event session search and logging, allowing groupings of alerts dynamically from a grouping of 30,000. SMTP email session including subject, send and receive email and body text in HTMP format. File attachment reconstruction from original mime format. HTTP, email and file transfer session logging, identification and reconstruction of files and associated metadata in original mime type for viewing and analysis. Federate multiple capture appliances in multiple locations. Click here for more information on Packet Continuum’s new and original features to secure your network. Click here for a downloadable datasheet to share (PDF).